Tuna Guacamole is great dish for an appetizer, snack, or impromptu little meal. I know it may sound a bit strange, but trust me, it’s yummy! And it takes less than five minutes to make — especially if you start with a high-quality, freshly-made, store-bought guacamole. Place the guacamole into a bowl and then mix in the tuna. Then add, according to your taste: lime juice, green onions, cilantro, fish sauce, salt, and pepper. Mix it all up; taste and adjust seasoning. Take a leaf of endive and partially fill it with a dollop of Tuna Gaucamole. Garnish with finely diced red onions and red bell peppers. Serve! 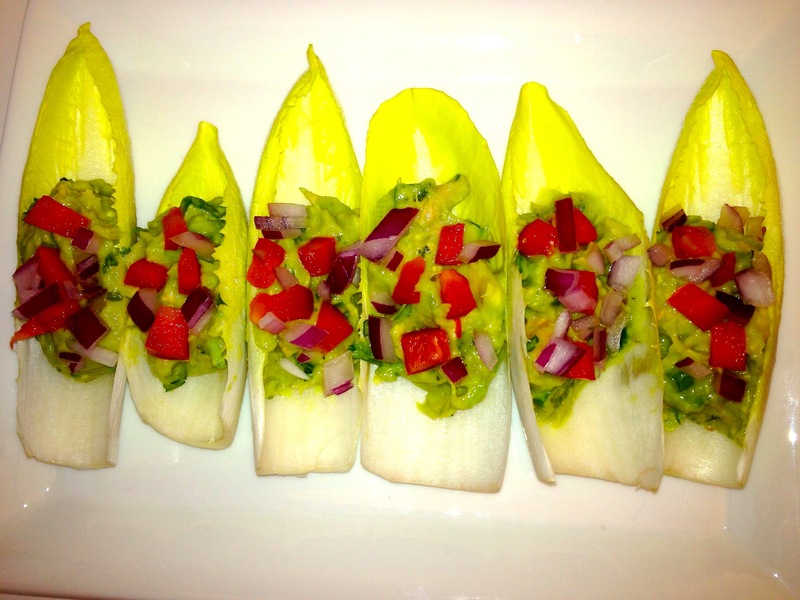 Place a small scoop of Tuna Guacamole into leaf of Butter lettuce and top that with the red onions and red bell pepper. Wrap the lettuce around the mixture and enjoy! Tuna: I really like the Wild Planet Wild Albacore Tuna. It’s pole-caught, high quality tuna, that is “highest in omega 3 and low in mercury.” And, it’s canned without added oil or water in BPA-free cans! It’s a premium product for a premium price, but it’s a good value when you buy through Amazon Subscribe & Save (which is what I do)! Fish Sauce: Tra Chang Brand Fish Sauce is my current favorite. It is made from anchovies, salt, sugar – and nothing else. I bought a 25-ounce bottle for just a few dollars at one of our local Asian supermarkets. For a side-by-side comparison of popular fish sauces, see the blog post, Thai Fish Sauce Taste Test. Note: All fish sauces are sky-high in sodium, but the Tra Chang Brand is lower in sodium than most. And, you don’t need to use a lot to get a great flavor hit! Red Bell Pepper: Because red bell pepper is on the Environmental Working Group’s Dirty Dozen Plus list (in 2013), I only buy organic red bell peppers. Excellent BLOG. So wonderful to meet you and Charles tonight at Under the Olive Tree!